Swanton known as Grandma Lampman, who was known for her knowledge of tribal customs and medicinal herbs. fish, and gather in the Refuge, they were no longer allowed to live there. recognized as its primary caretakers. 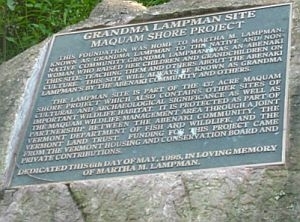 Lampman to the Abenaki community. gathering, and berry picking area for the Abenaki community. and spiritual to my family and others. plaque in memory of one very special Abenaki woman. VPR is celebrating Women’s History Month – and the Champlain quadricentennial – with stories of five women who contributed to the history and culture of the Champlain Valley. Among them is the story of Florence Weld, longest-serving director of Camp Hochelaga on Lake Champlain, told by Mrs. Weld’s granddaughter, Joan Curtis.